If you're on the hunt for a casual yet seriously stylish ensemble, pair a black polo with Incotex slim fit chinos. Both garments are totally comfortable and will look great together. White low top sneakers complement this outfit very well. This combination of a grey plaid blazer and Incotex slim fit chinos from farfetch.com is so easy to pull together in no time, helping you look dapper and ready for anything without spending a ton of time rummaging through your closet. And if you want to instantly up the style ante of your look with one piece, add brown leather oxford shoes to the equation. If you're searching for a casual yet seriously stylish outfit, consider wearing a dark green print short sleeve shirt and dark green chinos. Both pieces are totally comfortable and will look great together. White plimsolls are an easy choice here. If you're after a casual yet seriously stylish look, reach for a white crew-neck t-shirt and Incotex slim fit chinos. Both pieces are totally comfortable and will look great paired together. Make your ensemble more fun by rounding off with black leather work boots. If you're after a casual yet dapper outfit, dress in a dark brown parka and Incotex slim fit chinos from farfetch.com. Both garments are totally comfortable and will look great together. Green athletic shoes will add a sportier vibe to your ensemble. 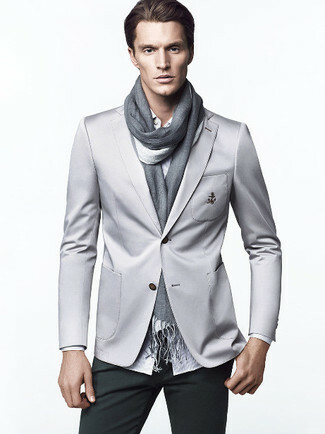 For a casually elegant outfit, consider teaming a grey blazer with dark green chinos — these pieces go perfectly together. 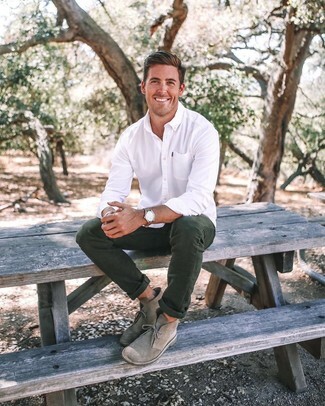 Infuse an elegant touch into your current styling lineup with a white dress shirt and dark green chinos. 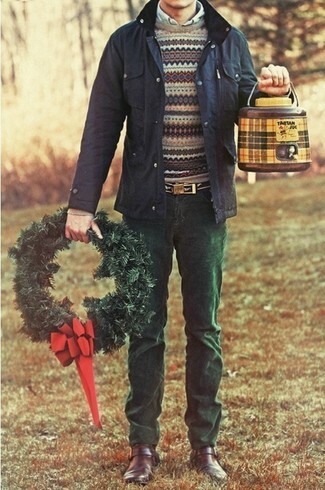 For a more casual twist, why not add grey suede desert boots to this getup? So as you can see, looking stylish doesn't require that much effort. Just try pairing a charcoal overcoat with dark green chinos and you'll look savvy. Make your ensemble more fun by complementing it with white low top sneakers. 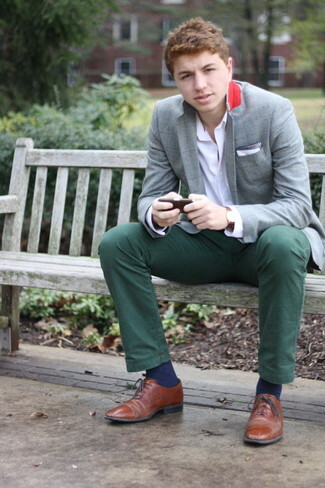 If you're in search of a casual yet dapper outfit, pair a navy field jacket with dark green chinos. Both pieces are totally comfortable and will look great paired together. A pair of dark brown leather double monks adds some real flair to this ensemble.